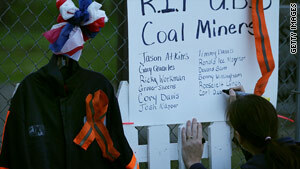 Mickie Green writes the names of 29 fallen coal miners on a small memorial April 10 in Whitesville, West Virginia. (CNN) -- Coal-producing giant Massey Energy defended its safety record Monday after the worst U.S. mine disaster in decades and rebuffed calls for its CEO to step down. Stan Suboleski, a member of Massey's board of directors, acknowledged the company's Upper Big Branch Mine had a high number of citations for serious safety violations. But he said federal inspectors found "no major issues" with the mine a few days before the April 5 explosion that killed 29 miners, and no hazards were found the day of the explosion. In addition, Suboleski said, the federal Mine Safety and Health Administration required changes to the mine's ventilation system in September that company engineers found "significantly reduced" the amount of fresh air that reached the portion of the mine where work was taking place, and the company resisted that change "to the point of shutting down production for two days" before agreeing. Amy Louviere, a spokeswoman for MSHA, said the issue Subleski raised will be part of its investigation of the disaster. "MSHA's accident investigation team will thoroughly examine the mine's ventilation plan and any changes required by MSHA in order to determine the volume of air flow," Louviere told CNN. A preliminary report on the disaster by MSHA found that the Upper Big Branch mine had "a significant history of safety issues" and that the agency was closely monitoring Massey Energy. In 2009, federal inspectors issued 515 citations and orders at the Upper Big Branch mine, with 39 percent of them for "significant and substantial" violations. Massey's safety record came under a harsh spotlight after the disaster at the Upper Big Branch Mine. Its CEO, Don Blankenship, has been an outspoken critic of federal regulators, and at least two investment funds have called for his resignation since the explosion earlier this month. But another Massey director, Bobby Inman, said Blankenship had the board's confidence, and that changing leadership "in the midst of a crisis" would be a bad idea. "When the crisis has subsided and we know the facts, we will maintain the highest standard of accountability and responsibility," Inman said during a news conference in Charleston, West Virginia. And Blankenship offered condolences to the families and co-workers of the men who died in the blast, saying, "We know there are no words to describe either their losses or the sorrow they are experiencing." "In the past 20 years, we have done our best to engineer the dangers out of coal mining," Blankenship said. "We have made great strides and been proud of our accomplishments. But on April 5, we lost 29 great coal miners, and we don't know why. This has left us humbled and hurt and searching for answers." Since the disaster, President Obama has ordered a review of mines with poor safety records. He called Massey's safety record "troubled" in an April 15 appearance. Massey called the criticism "regrettable."